Whitby Town visit Marine on Saturday, looking to claim their first away league win of the season. The Blues will seek to take advantage of the Merseysiders’ poor home record which has seen them claim just one Evo-Stik Premier Division success at Rossett Park this campaign. Manager Darren Williams is however expecting the Whites to provide his side with a stern test. 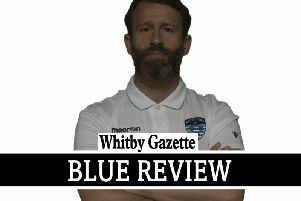 “We know it’s going to be difficult at Marine, as they are a decent side,” he told the Whitby Gazette. “They’re traditionally very hard-working and tough to play against, plus they currently have a couple of strikers who are scoring a few goals and will pose a real threat. The Seasiders are likely to have striker Mikey Roberts back in contention after injury, alongside midfielder Dave McTiernan, who returns from suspension. Town lost out 2-1 in the corresponding clash, last season, despite taking a first-half lead through Dale Hopson’s penalty. Fourth-bottom Whitby go into tomorrow’s game two points adrift of Colwyn Bay with a game in hand. Kick-off on Merseyside is 3pm. The Blues are then away for the third successive game when Scarborough Athletic provide the opposition at Bridlington in the Doodson Sports Cup on Tuesday, 7.45pm kick-off. Boss Williams is expected to rotate his squad despite the local rivalry involved. A coach to Queensgate in Bridlington leaves the Turnbull Ground at 5pm on Tuesday. Contact Graham Manser on 07966 241344 to book a place.